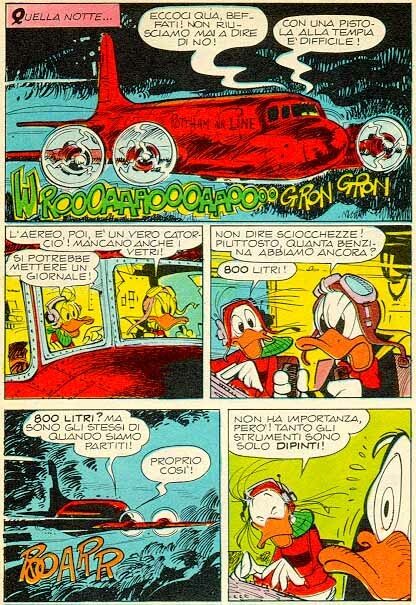 Unquestionably the most innovative and dynamic of all the Italian Disney artists, Giorgio Cavazzano started his precocious Disney career at the age of 14 as the third inker of Romano Scarpa, then 34. Although he has written a few scripts himself, he is above all an outstanding graphical artist. 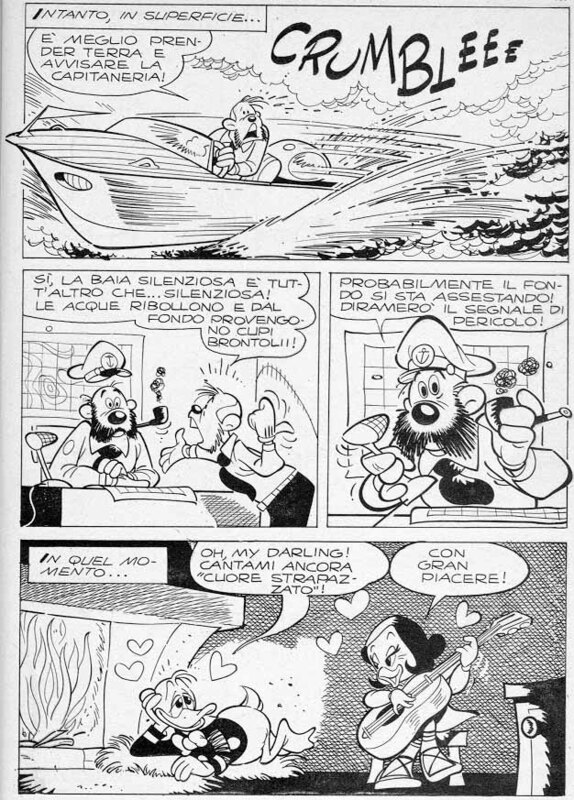 Born in Venice in 1947, Cavazzano, a true natural talent, was already inking the pencils of his cousin Luciano Capitanio at a mere 12. 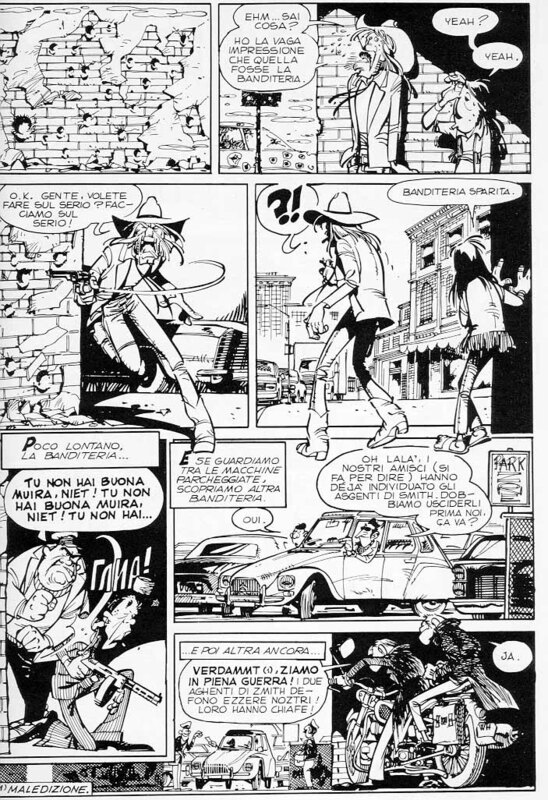 After a few years of inking practice as Scarpa's apprentice he asked his master to let him have a go at the pencils: his first story as a complete artist, written by Abramo Barosso and scripted by his brother Gian Paolo (a detailed study [in Italian] backs this attribution), appeared in 1967 as "Paperino e il singhiozzo a martello" (TL 611), recently reprinted in CWDNS 211. 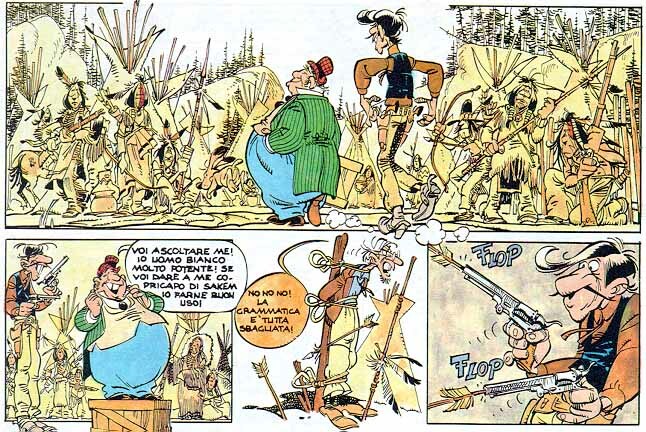 His creative curiosity got him interested early on in many great non-Disney artists such as Uderzo, Franquin, Jacovitti � then virtually unknown to most of his narrow-minded colleagues at Mondadori. Guided by a powerful urge to innovate he boldly experimented, during the early and mid '70s, with a new, vibrant graphic style in which the rubber-like qualities of the traditional Disney characters merged with adventurous and realistic rendering of machinery and techno-gadgets. 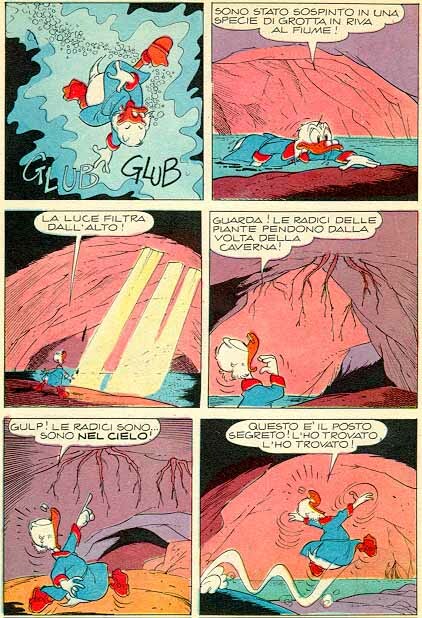 His best stories from this "techno" phase, mostly scripted by the gifted Giorgio Pezzin, stood out so obviously from the rest that even very occasional readers would recognise and appreciate him at once � anyone who was a Topolino-reading kid at the time will remember the submarine of "Paperoga e il peso della gloria" (TL 1007, 1975) and the kamikaze bomber of "Paperino e l'eroico smemorato" (TL 1059, 1976). 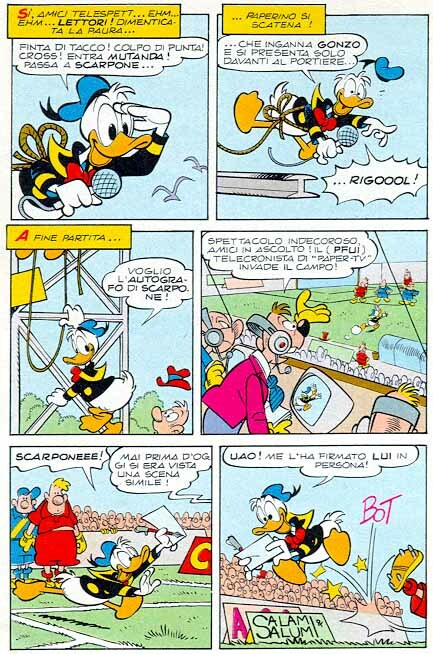 He was obviously venturing very far from the Disney canons, and anyone of lesser talent doing the same would have simply strayed off course; but, to bring back an often-quoted remark by comic writer Tiziano Sclavi, "Over the years, Giorgio managed to be Cavazzano and Disney at once. 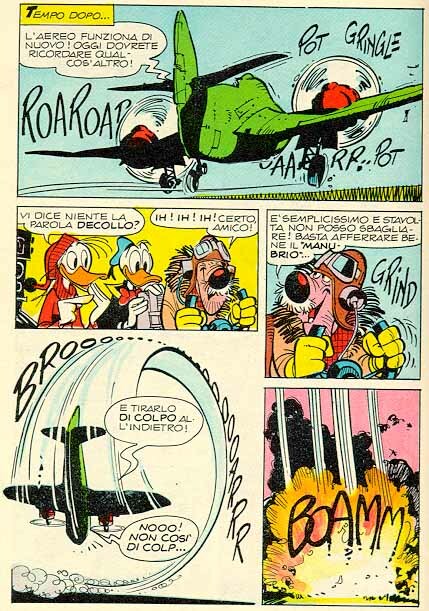 Before him, this had only been achieved by people like Carl Barks.". Giorgio did this wonderful little sketch for me in just a couple of minutes (!!!) while we were at lunch in Lucca in November 1997. It's on the first page of the book, edited by Luca Boschi, that reprints this very same essay (see the bibliography below for details). 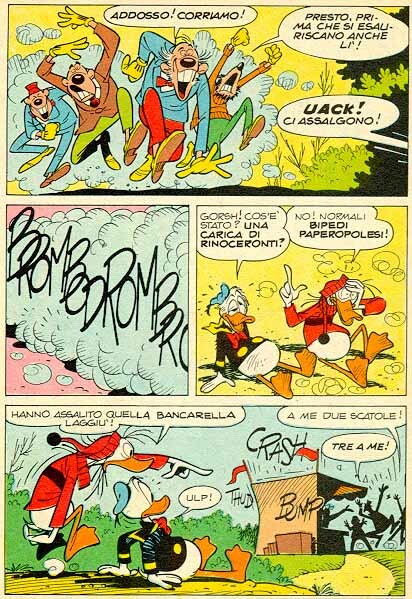 Cavazzano's influence on other Disney artists has been enormous. 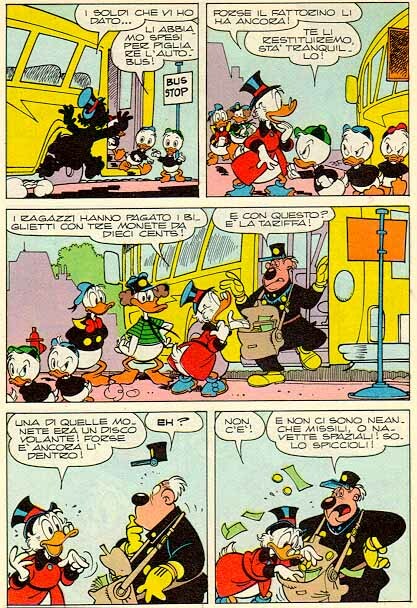 Taken as an ideal of perfection by many if not most of the Italian Disney artists of the new generation (some of whom sadly fail to see the importance of expanding their comics culture beyond their very narrow horizons before settling on slavish imitation of a model, however good), he was also inspirational to the evolution of his great contemporary Massimo De Vita. Besides ducks and mice the eclectic venetian artist has also been focusing his skills on many other fields. 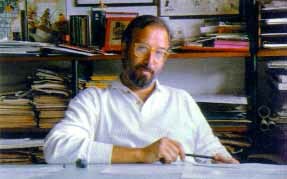 Over the course of his career he created an amazing array of comics characters outside the Disney universe, among which are Walkie & Talkie (1974), Oscar e Tango (1974), Altai & Jonson (1975), Smalto & Jonny (1976), Slim Norton (1977), Silas Finn (1979), I due colonnelli (1977), Big Bazoom (1983), Capitan Rogers (1981), Timoth�e Titan (1987), Jungle Bungle (1991), not to mention his work in advertising. 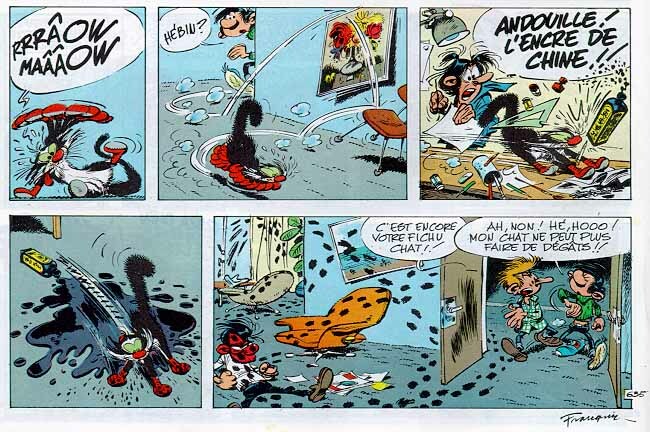 He is the recipient of many comics awards. The Cavazzano fan can rejoice: our author is now rather popular. I still feel that there is a gap to be filled, in that there is no true ultimate book on Cavazzano yet, but the union of the sources below is pretty good reading anyway. Sorry, but they're all in Italian. 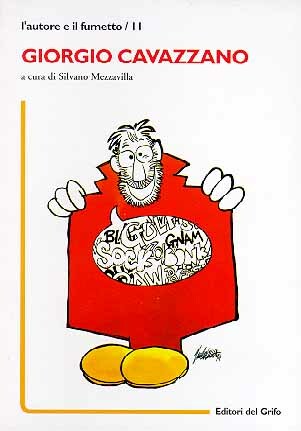 Silvano MEZZAVILLA (ed. 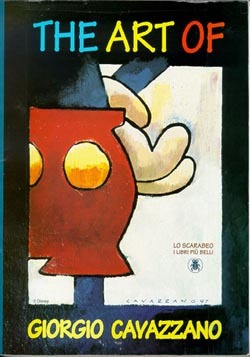 ), Giorgio Cavazzano, Editori del Grifo, 1994, ISBN 88-7773-246-6, 128 pg, Itl 18000. If you're interested in Cavazzano you can't miss this one. 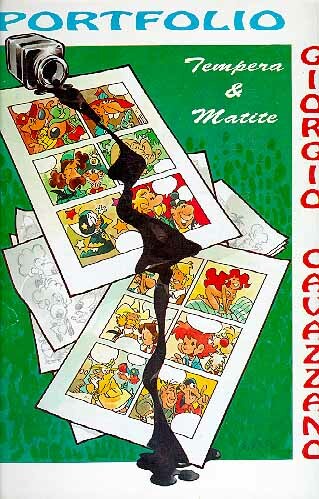 The lavishly illustrated booklet (mostly black and white but with some colour pictures) opens with a long interview, goes on with 10 pages of photographs and then offers a dozen contributions by well-known comic authors and critics, each writing three or four pages and presenting Cavazzano from a different angle. After this, an extensive index of all his stories, both Disney and not. 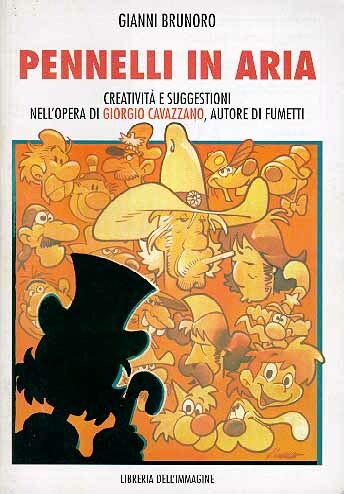 Gianni BRUNORO, Pennelli in aria, creativit� e suggestioni nell'opera di Giorgio Cavazzano, autore di fumetti, Libreria dell'immagine, 1994, 48 pg, Itl. 6000. Thin, cheap, good value. 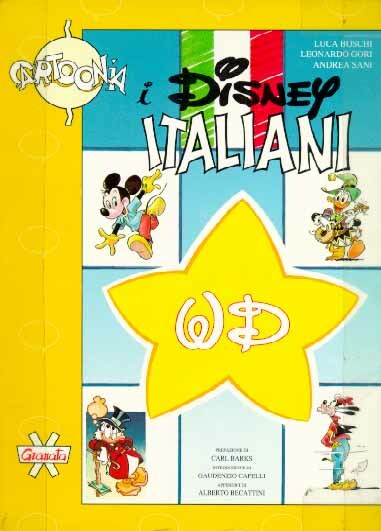 Its story index isn't too accurate, but buy the booklet for the excellent card file on all of Cavazzano's non-Disney characters. Worthy of note also for its 10-page interview and for some interesting commentaries. 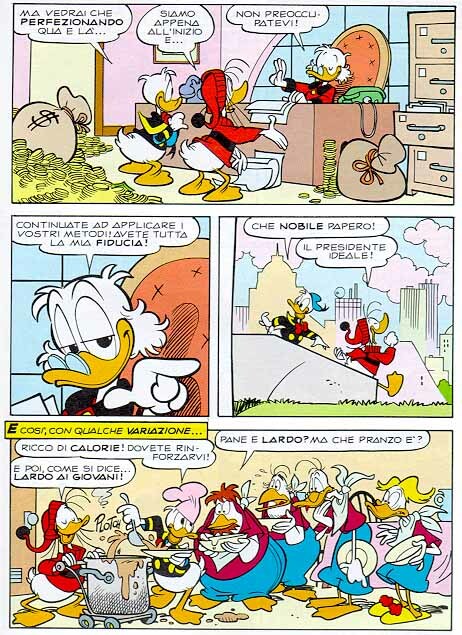 Gulliver n. 5, Club Amici del Fumetto, May 1995. A large-format (24x34cm), low-circulation fanzine which is probably going to be hard to track down. It contains the most complete, accurate and up-to-date Cavazzano index of those I've seen, a long interview and two non-Disney science fiction Cavazzano stories scripted by Rudy Salvagnini. But best of all is the optional portfolio with12 outstanding large-format reproductions of illustrations (tempera and pencils) that the master did especially for this publication. ...dedicates an entire chapter to Cavazzano. Well worth reading. 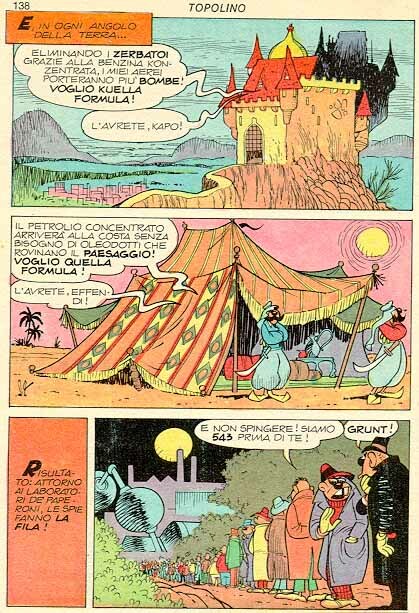 In fact, both the Mezzavilla and the Brunoro books mentioned above quote portions of this chapter. Luca BOSCHI (ed. ), The Art of Giorgio Cavazzano, Lo Scarabeo, 1997, 128 pg, ISBN 88-86131-51-8. At last a full length book! This one came out after this web page was written and in fact it includes this essay as one of its chapters (if we except a certain entry in the bibliography...). 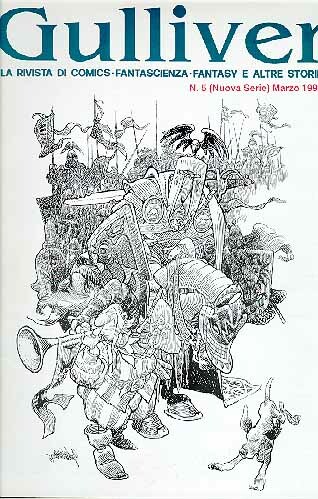 It is by far the most comprehensive resource of all the ones mentioned above and it features a wonderful collection of previously unpublished illustrations. You really can't miss it. Despite the title, it is all in Italian, except for my chapter (the one you're reading here) which was left in English. 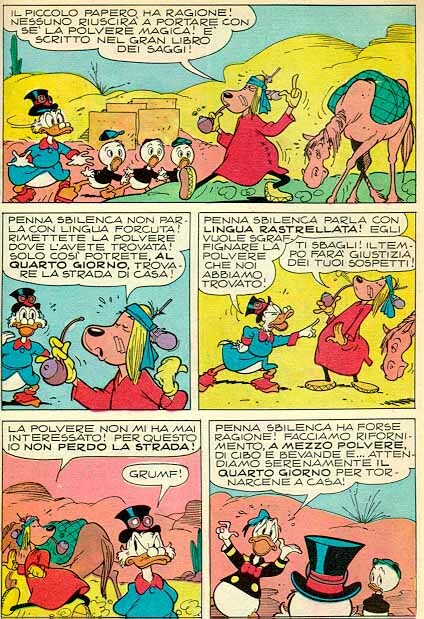 As I did with Scarpa some time ago, I'll go through Cavazzano's Disney stories highlighting the different phases in his graphical evolution. Cavazzano is a peculiar artist in that at various stages he changed his style so much that it might be more appropriate to speak of "revolution", or even "metamorphosis", instead of "evolution". 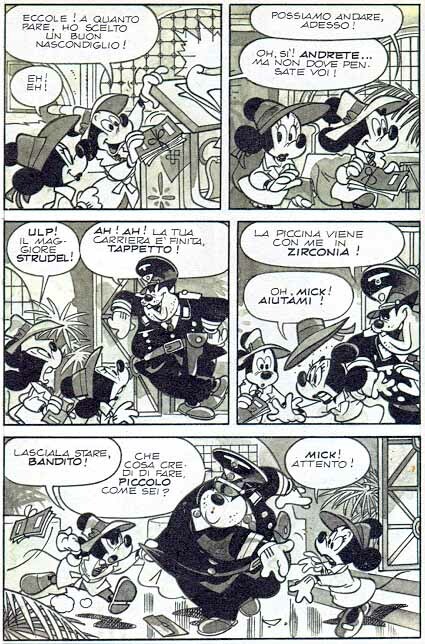 During my first ventures as a Disney philologist many years ago, without the help of a chronological framework, I even thought that "Bel Tratto Sottile" and "Techno" were two completely different people! Thus a chronological analysis of Cavazzano's work is particularly interesting and revealing, as it pinpoints those narrow transitions between periods that highlight the continuity within the metamorphosis. Once again let me warn you that the names of these phases are of my own invention and that, as with anything related to aesthetic judgement, you might have wildly different opinions on the subject. 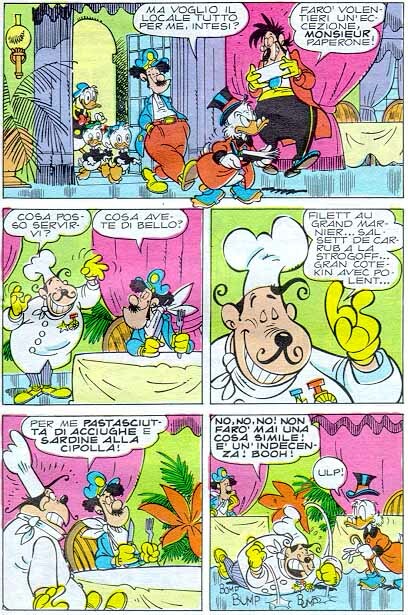 I based my study on the chronological index by Luigi Marcian� contained in the Gulliver fanzine referred to above, which I consider to be the most accurate so far. The name after the story title is that of the author of the script. If you know of any non-Italian versions of any of the stories mentioned, let me know the exact title and I'll add it next to the original to help those who speak your language recognize the story too. 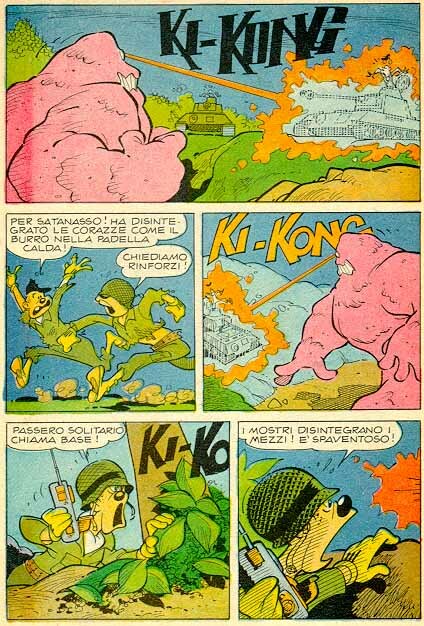 I am also noting other Italian reprints of the story where I am aware of them, although information on reprints is not intended to be complete. 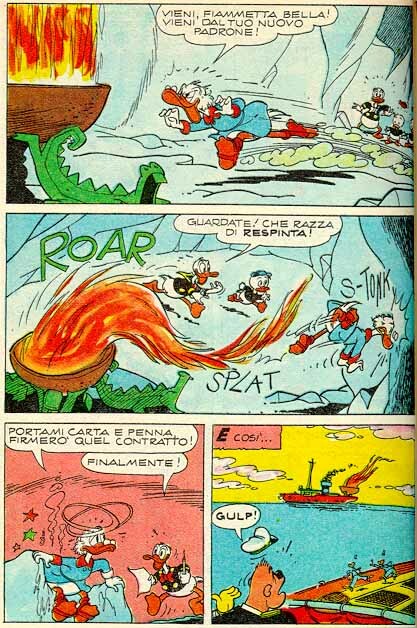 Scarpa's influence is very heavy on these first stories. 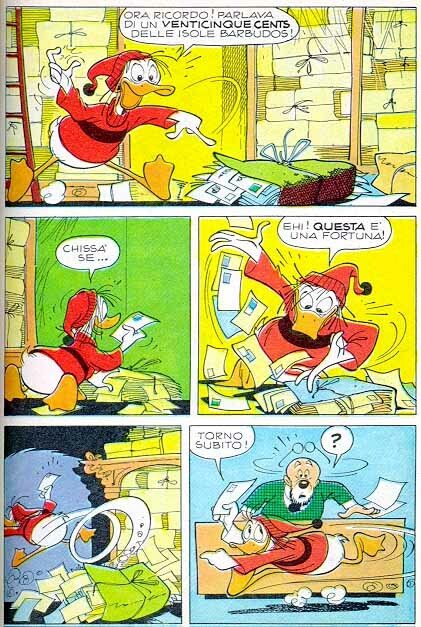 And, although sometimes the proportions of the main characters may look slightly odd and give the game away, in many cases even an expert eye could be forgiven for mistaking a Cavazzano page for a Scarpa one (see in particular the "golf redditizio" and "casa gonfiabile" stories below). 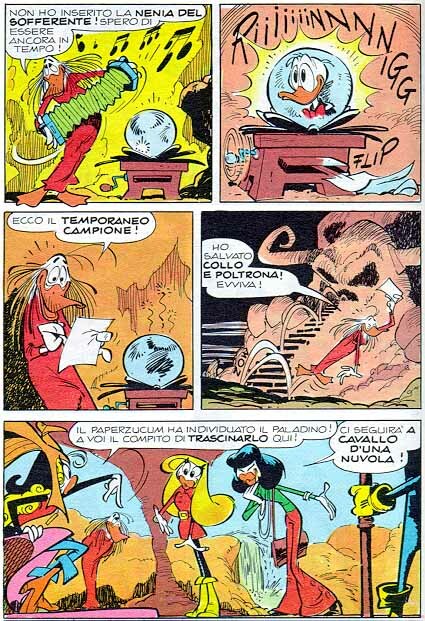 The similarity is of course accentuated by the fact that in this period Cavazzano was inking both Scarpa's stories and his own, so the finishing stroke was the same. 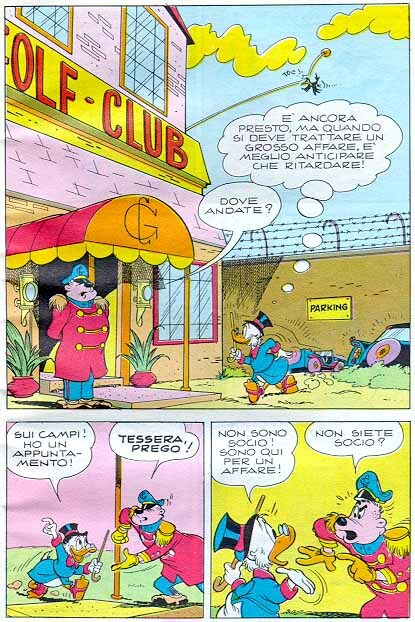 As a curiosity we may note that the presence of a "golf club" in Zio Paperone e il golf redditizio, Cavazzano's second story, gave our artist the opportunity to embed his monogram (the interwoven G and C letters) in some panels without asserting straight out that it was his signature. He will play this trick again over the years, peppering many of his stories either with this monogram (for which the golf redditizio story is the first appearance), or with a cursive signature or even something else. The classic fan game is to re-read a well known story trying to spot some hidden Cavazzano trademark. In just a couple of years after drawing his first stories Cavazzano graduates from apprentice to master, reaching maturity (or rather his first maturity, I should perhaps say) and his own personal style. There is still a noticeable Scarpa influence, but the work is easily recognisable as original. 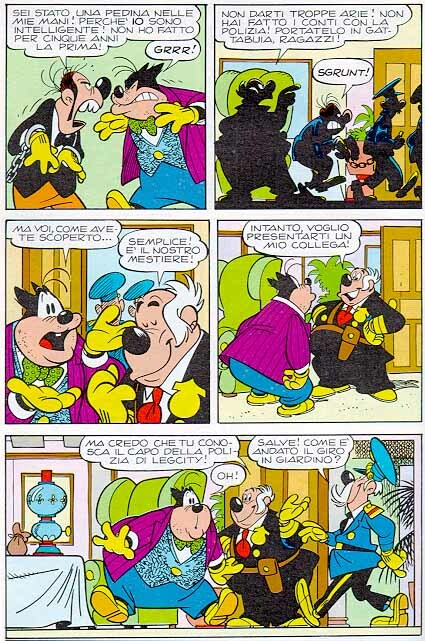 Compared to Scarpa, he shows a tendency to draw very thin or very fat characters, something he'll do even more in later years. His stroke is beautiful � thin and very elegant; in fact this is what Bel Tratto Sottile means. I've called him that for so long, before realising he was the same as "the well-known Cavazzano" (i.e. the Techno one) that I couldn't persuade myself to change this name even for this English-language description. 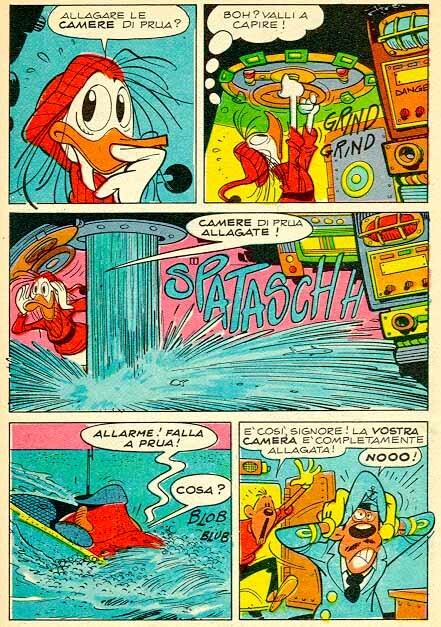 During this phase his most fruitful collaborations are those with the great Rodolfo Cimino, who writes for him many fascinating plots of Duck adventures in faraway locales with elements of wisdom from ancient people. 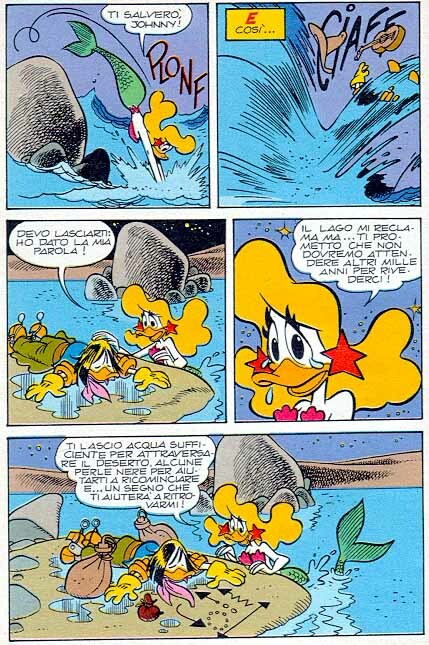 A wonderful romantic story in which Donald falls in love with Reginella, a beautiful underwater queen coming from another world. 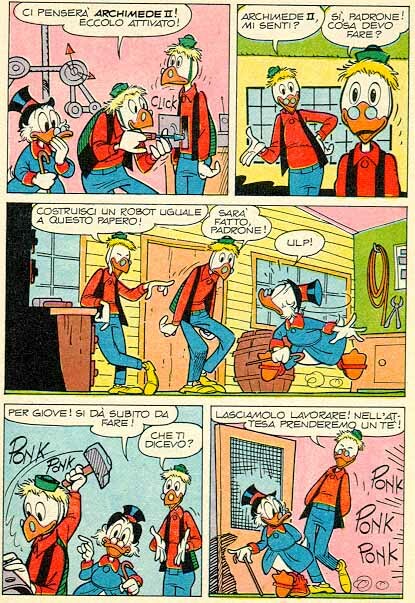 This story left a deep mark in many readers as Donald had at last found a true love, unlike the superficial and ever-incomplete relationship with the voluble Daisy Duck. Cimino and Cavazzano came back to it several times, probably encouraged by fans, adding an episode every few years, always making it look like it would really be the last possible meeting, well aware of course that this love story could not have a happy end within the Disney continuity. I said that Bel Tratto Sottile was Cavazzano's first maturity. In fact, for anyone else, it might very well have been the apogee of an excellent career: splendid art and good teamwork with imaginative script writers. But our author went on. 1973 was the transition period of this dramatic change of style, from a thin and elegant stroke to a nervous and powerfully dynamic one which mixed thin pen lines with heavy brush strokes and breathed fresh new life into the Disney cast. In an interview appearing in the Yellow book (p. 147), Cavazzano himself mentions this story as a turning point. 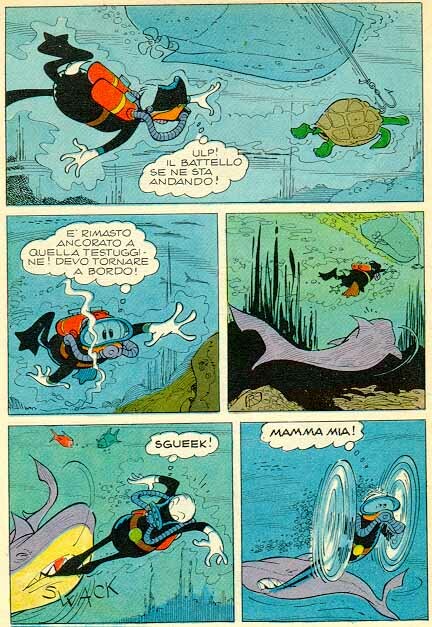 "...One morning I noticed a change in my style: I was drawing a page with the ducks swimming towards the bottom of the sea, wearing black wet suits, and I suddenly felt I discovered something very important, seeing that I could move them in a way that was different from the usual one. Even now I experience some emotion when talking about it, because everything started from there. It's from that moment on that I started to modify the characters and study them in a personal way." 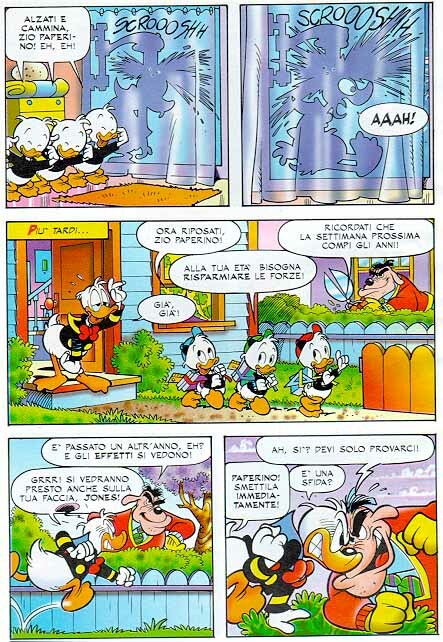 This is where Cavazzano takes the Disney comic world by storm, electrifying the characters and breaking the canons of conventional Disney-style art. 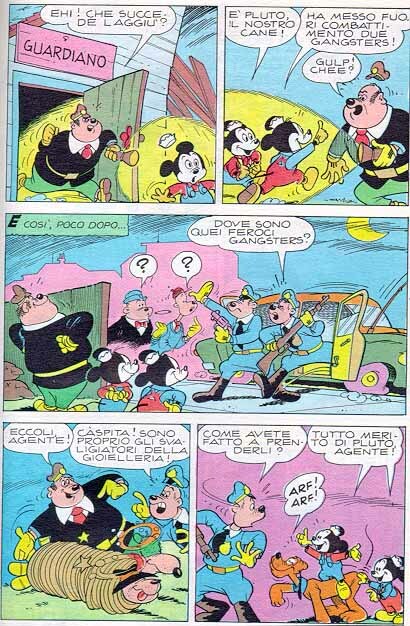 This is when people start to recognise that there are Cavazzano stories in Topolino, even at a time when the publisher didn't print any credits, because most readers can recognise this very personal and dynamic style and relate it to other non-Disney comics by Cavazzano. While his characters tend more and more towards caricatures, either slim and tall or round and fat, the machinery is rendered with accurate and realistic detail. Page layout and viewing angles are also new fields for bold experimentation. 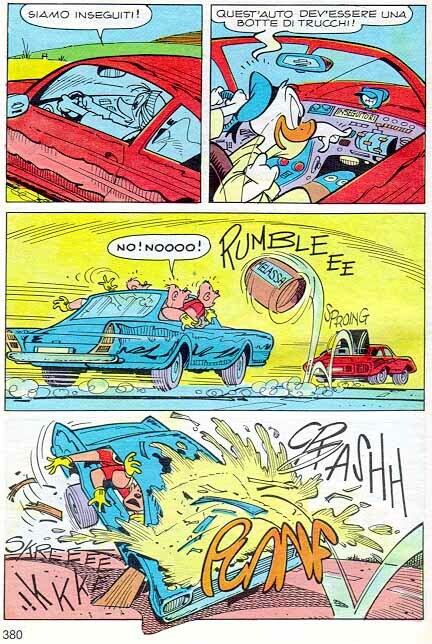 During this nervous, dynamic and exciting graphical phase his best works are based on frantic plots by Giorgio Pezzin, who has an excellent sense of rythm and punctuates the stories with frequent hilarious gags. 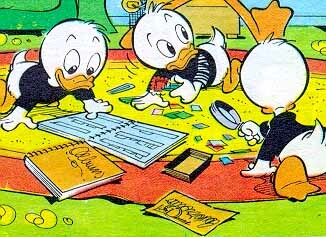 Their Fethry Duck / Donald Duck stories are absolute masterpieces. 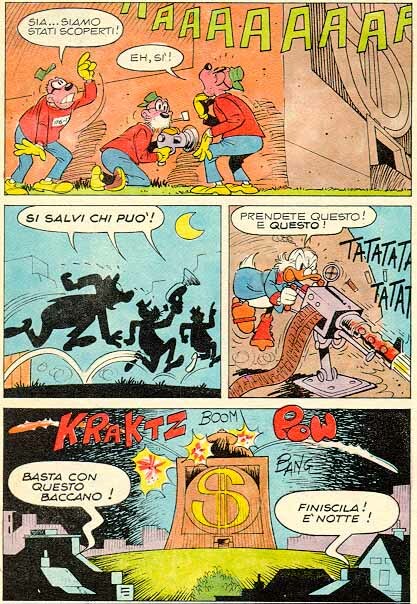 Note that, at the same time, the Pezzin / Cavazzano duo was also working on other similar comic character pairs: Walkie e Talkie, Oscar e Tango and most notably Smalto e Jonny. 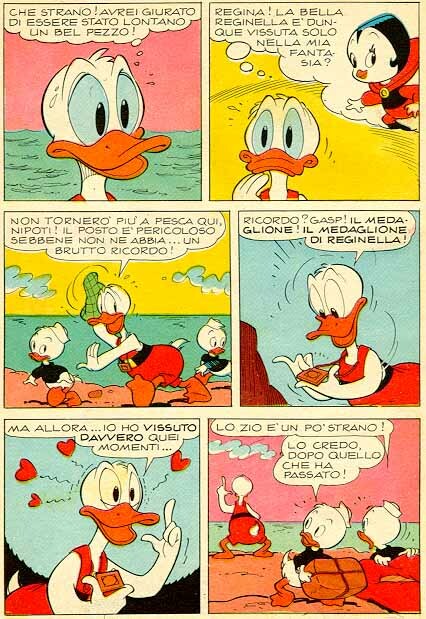 Second installment of Donald's special love story, and perhaps the most romantic. Perhaps the most famous of the Fethry/Donald stories, this is the one with the atomic submarine. We could have called Techno a second maturity, again in the sense that Cavazzano was then a complete and accomplished author and would have got his place in the history books even if he had done nothing different after that. Instead, when viewed in the wider context of his actual evolution, Techno itself appears to be a transition phase, an extended experiment that allows Cavazzano to sharpen new tools for what becomes his later, true maturity. He tones down the wildest graphical extremes and lets his previously restless characters cool down a bit. He is still definitely master of his art, only no longer an unrestrained crazy genius. 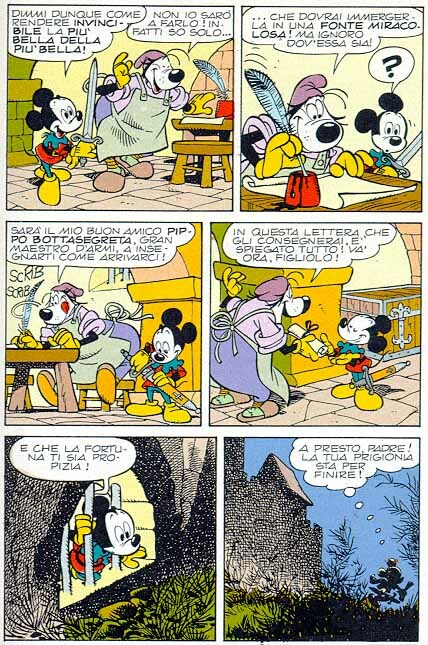 I called this phase The Model because most of the new artists joining the ranks of the Italian Disney publisher look at him, at this Cavazzano, for inspiration. Up to a point, this is very flattering; but after that it becomes slightly annoying. Cavazzano gets back to this very modern (but now within the canons) style after a long personal journey through the other phases we've seen, so he "earns" this modernity through his distilled experience. 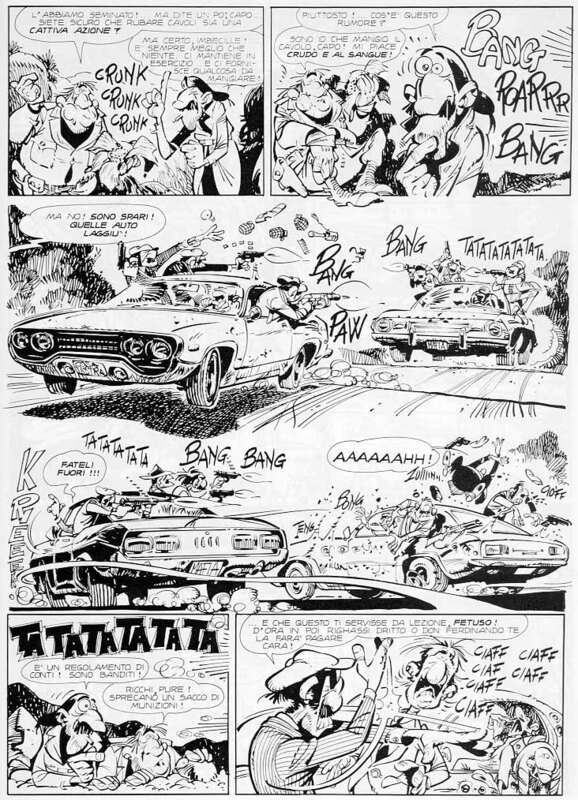 But many of the new authors pick up this style not as the result of a personal growth but simply because Cavazzano is the most popular and modern artist, thus achieving only superficial results. 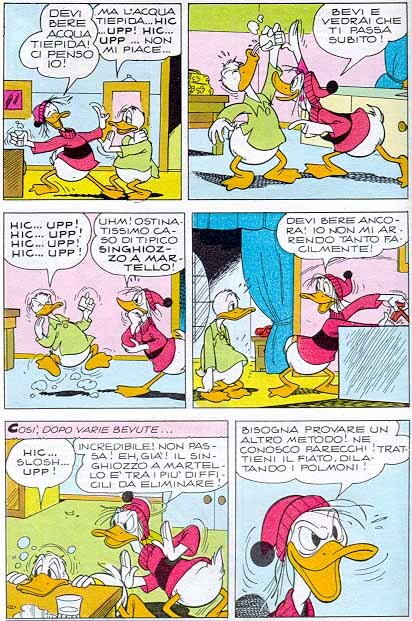 Among the best things of this long period are the stories with the alien duck OK Quack and the private detective Umperio Bogarto, two new characters created by Carlo Chendi. 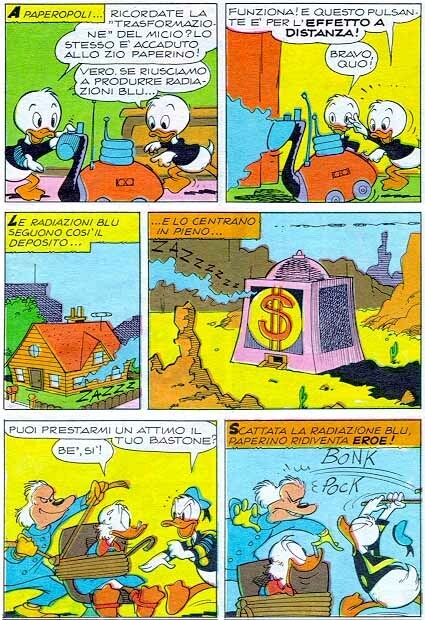 First story with OK Quack. One of the very few stories scripted by Cavazzano himself, this parody of the Humphrey Bogart film is uniquely rendered in painted black and white. This is not really a separate phase from The Model; we're still in the same basic period, with the same distinguishing features. But I opened a new section (the boundaries of which are actually rather fuzzy) to remark that lately Cavazzano has evolved towards a more essential style, almost spartan. Elegant as always, but with fewer, heavier strokes. Even if the inflation of would-be Cavazzanos has almost stolen his own style from him, he still is the only one who really owns it because it comes out of his personal journey. 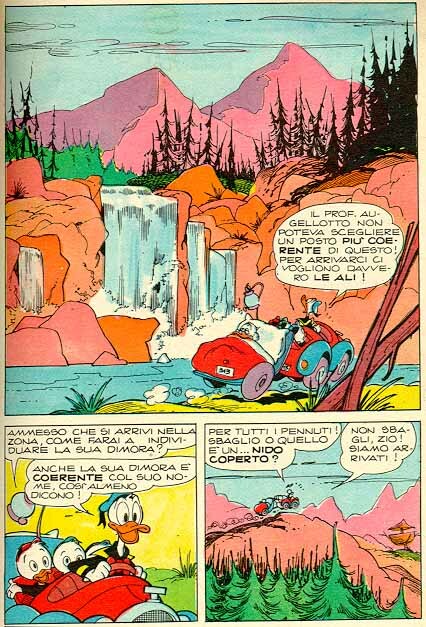 Proof of it is, he is the only one who can render the Cavazzano style with just hints, instead of all the intricate detail that used to characterise it. 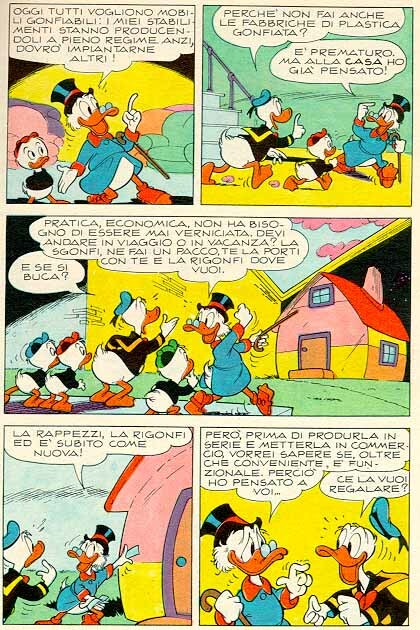 Absolute masterpieces from this phase are the sword stories by Marconi (especially the first one, "Topolino e la spada invincibile") and the new romantic series by the poet Cimino, "Nonna Papera e i racconti intorno al fuoco", where Grandma Duck becomes the storyteller of stories that don't involve Donald or Mickey. 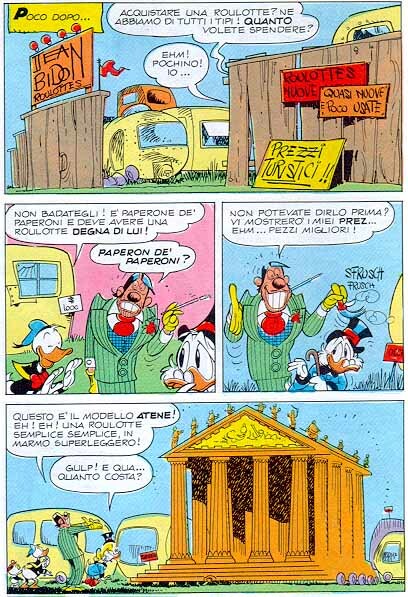 This story is unusual from several points of view: it was done originally for Egmont instead of Disney Italia and it features electronic colours (by Leopoldo Barbarini), still not too common on Italian stories. 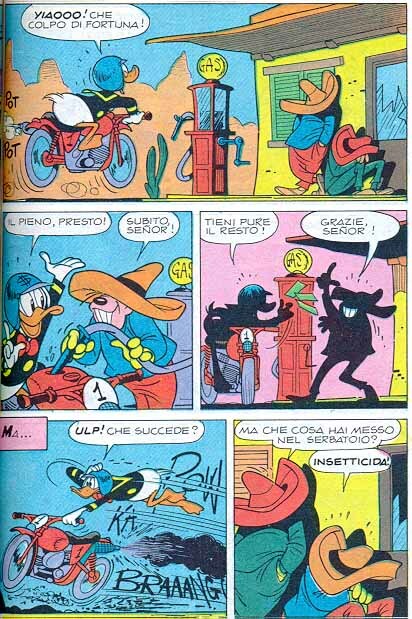 The letterer, too (Diego Ceresa of Zio Paperone fame), is not the usual one for Topolino. TL 2011 credits the script to Bob Foster, but Harry Fluks tells us on disney-comics (1996 05 20) that the true author is Janet Gilbert, Foster being only the editor. Gilbert's original title is "No Fool Like an Old Fool " and the Egmont story code is D93135. 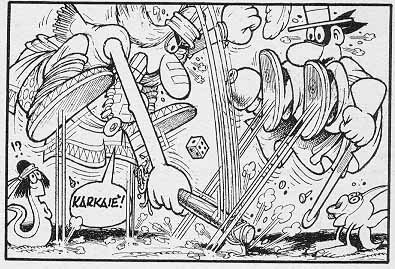 Reprints exist in at least Danish (Jumbobog Ekstra "Hurra for Anders And "), French, German (L. Taschenbuch 196). 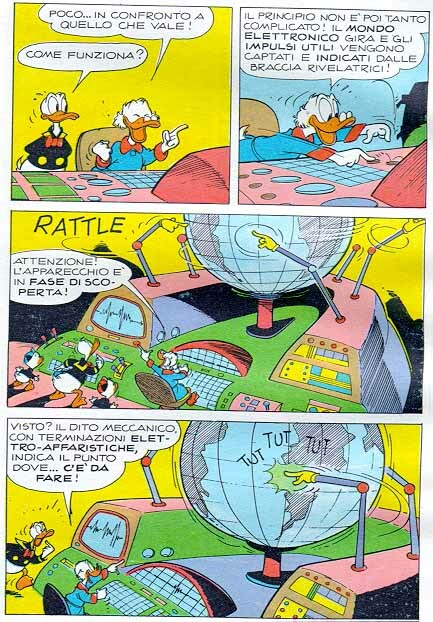 All the Disney comic images available from this page are (c) The Walt Disney Company Italia. They are provided for purposes of study and reference, to allow the reader to personally compare the periods being talked about and/or identify a foreign translation of a story. Disney's copyright is acknowledged and respected. Originally written in Netscape Gold and completed on 1996 05 19. Last updated 1998 10 11.